Bringing together masters from different traditions, Dovetail Ensemble surprises and wows audiences with its adventures in cross-cultural collaboration. 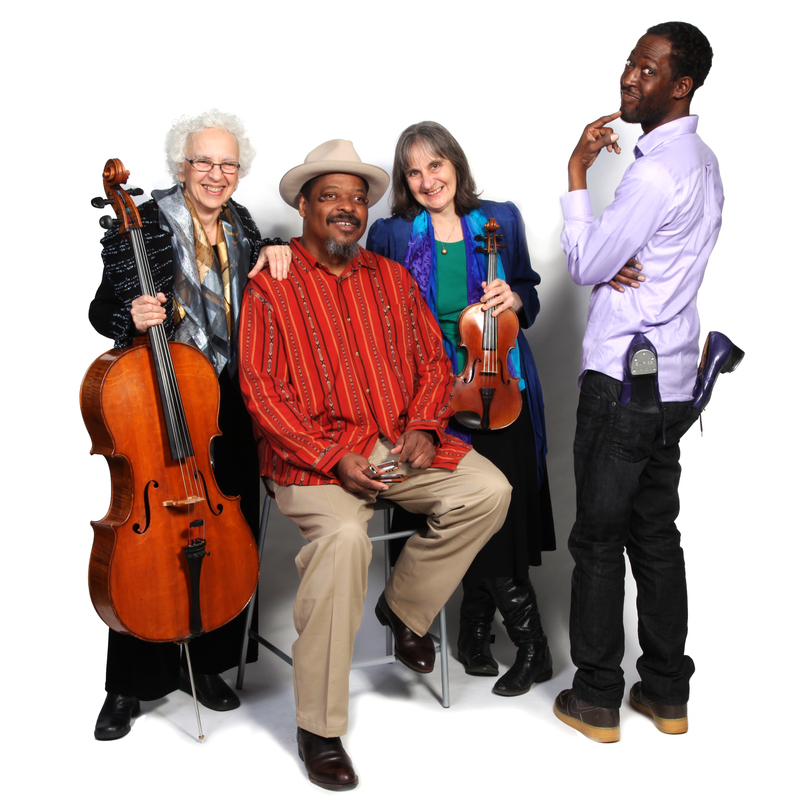 Blues harmonica master/songster Phil Wiggins, Broadway star tap dancer Baakari Wilder, Andrea, and Jodi Beder, classical cellist, synagogue musician, and member of cabaret-rock band Zen for Primates, form a core ensemble that expands to seven, with new voices keeping it always fresh. From Latin jazz to Irish jig, from Purcell to Mississippi John Hurt, from Romanian hora to Swedish polska, each performance is full of jaw-dropping moments from artists who genuinely love exploring together. A unique blend of Celtic and American roots music as the musicians create lyrical interpretations of traditional music. 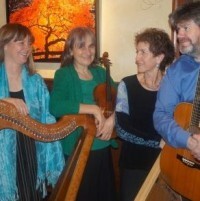 The quartet includes well known American-based traditional folk musicians Maggie Sansone on hammered dulcimer and Andrea Hoag on fiddle and Celtic musicians Sharon Knowles (from Scotland) on Celtic harp and Patrick Egan ( from Ireland) on guitar and vocals. Heartfelt and uplifting music and songs from the ancient Celtic Lands, lively and exciting Jigs and Reels from Ireland and Scotland and the Shetland Isles, old time fiddle tunes from the Appalachians, medieval carols, and surprises from beyond the borders. Bringing together many years of expertise in Scandinavian music, this trio creates soulful, playful, engaging performances. 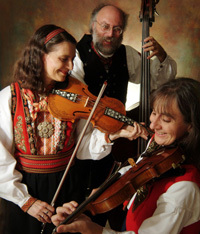 Their unique sound combines Andrea Hoag’s specialty in the older Swedish polska traditions, Loretta Kelley’s mastery of the Norwegian Hardanger fiddle, and the creative harmonies and sense of fun Charlie Pilzer has honed as a member of the Faroese band Spaelimenninir. From the oldest tunes and tonalities to rousing 19th–century dance music to fresh originals, Hoag/Kelley/Pilzer leave audiences both full and hungry for more. 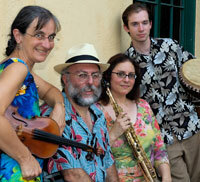 Savvy arrangements, humor, and the love of good story add dimensions to impeccable musicianship. 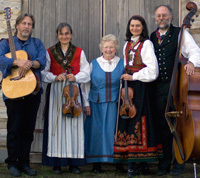 Based on the Wisconsin–Norwegian tradition of Eleanor Berntson Lundeberg’s family, the band plays music performed at dance halls and played in living rooms over the last hundred years and more, including many tunes unique to the Berntson family. Hoag, Kelley, and Pilzer represent the family “neighbors,” joining three generations of Berntsons—Eleanor on pump organ, son Karl on guitar and banjo, and granddaugher Marika on guitar—just as different families and cultures came together in Wisconsin farming and logging communities. The Berntsons have been featured at the National Folk Festival and the Library of Congress, and have recorded 2 CDs of family tunes. 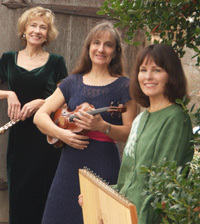 Providing elegant Celtic music for weddings, events, and concerts, this trio with Jody Marshall on hammered dulcimer and Barbara Heitz on golden flute brings charm and excellence to any venue. A growing presence on the national festival scene, Jody comes by her musical inventiveness honestly (her father left the Virginia coal fields to make a career as a jazz musician) and has won acclaim for her creative arrangements. Barbara Heitz combines years of classical performing with a deep love of the lyricism of Irish airs and English country dances. Adventurous, risk-taking, lyrical, and rhythmically compelling, Serpentine makes music for dancing: contras, tangos, waltzes, English ceilidhs. Charlie Pilzer (piano, bass, button accordion) brings forty years of experience in a broad variety of traditional-music genres with a deep knowledge of music theory. Leigh Pilzer (sister of Charlie), long-time professional jazz musician and professor of jazz theory and composition, plays soprano sax, bass clarinet, and cello with the band. Will Morrison, who grew up in Charlottesville surrounded by both traditional and classical music, provides relentlessly solid rhythm and playful imagination on drum kit and hand percussion.